There are classic fantasy games and there are classic fantasy games. 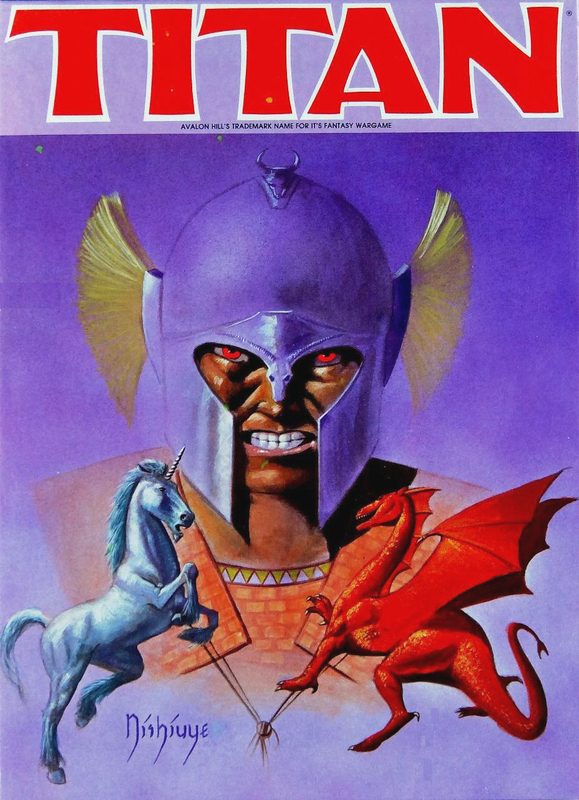 Jai Kamani and David A. Trampier’s Titan, a massive game of conflict between mythological armies of ogres, unicorns, griffons, and other creatures, was perhaps the most ubiquitous fantasy game of my youth. There were copies everywhere, tucked under arms at gaming conventions and on the shelves of department stores. 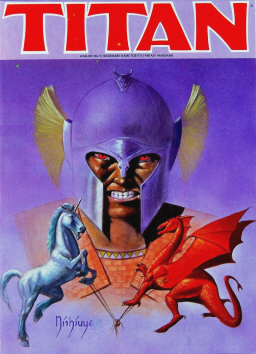 Titan was first published in an ultra-rare first edition in 1980 by tiny Gorgonstar, Inc. It was later made a hit by Avalon Hill, and remained in print for nearly two decades until Avalon Hill was sold and ceased operations in 1998. After that, copies of the most popular fantasy board game of the 80s and 90s gradually became harder and harder to find. I remember getting my boys excited about Titan by nostalgically telling tales of epic battles between behemoths, dragons, and trolls. They clamored to play it. I’d never owned Titan, but that’s not a problem in the age of the Internet. I found a pristine copy on eBay and hung on during a spirited bidding war. 90 bucks later, it was on my kitchen table. Still in the shrink wrap. It was perfectly preserved. My boys stood at my side, ready to go, anxious to throw down some dice, and experience some of that legendary Titan action. To shred the shrink and punch out counter sheets that had staunchly stood fast for over twenty years. My hands gripped the game, hesitating. I apologized to my boys, told them I’d find another copy, and put that one in the Cave of Wonders, next to Dragon Pass, Dark Emperor, Wizards, Elric, Magic Realm, and other Avalon Hill fantasy games. Back to eBay. I was a little more savvy this time. I hunted around, took my time, set myself limits. Another copy in beautiful shape came up. Bidding was lively. I was resolute. Soon, it was on our kitchen table. “There’s something wrong with you,” my wife said, watching me put this one next to the first. My boys looked on, dejected. As it turns out, I was only partially right. Canadian publisher Valley Games acquired the rights and brought the game back into print in 2008. The new version, with artwork by Kurt Miller and Mike Doyle, is a deluxe edition with premium components, including a beautiful color rule book, hard folding maps, and dozens of color counters printed on heavy cardboard stock. Heavy, in fact, is perhaps the best descriptor. The game weighs nearly eight pounds, and the contents barely fit into the huge 10 x 12 inch box. I ordered a copy of the Valley Games edition a few weeks ago, and have been very impressed. Produced by folks who obviously really love the game, they have pulled out all the stops to produce the ultimate version. I’m looking forward to finally teaching my boys how to play. Just not with this copy. It’s still in the shrink. 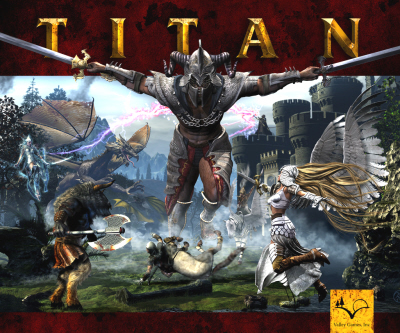 Titan was published by Valley Games in 2008. It is priced at $69.99. It was also adopted for the Apple iPad and released on December 21, 2011. Yeah, there’s something wrong with you. I’ve played one game of Titan. Three players, six hours. I won. I was told it had been a pretty short game, so I retired with a perfect record. That’s quite a find! HeroQuest is a highly prized collectible. I discovered it by playing the Amiga game waaay back in 1991. I eventually bought the board game, but I never bothered to track down the expansions. I wish I had! They’re almost impossible to find, and command very high prices in almost any condition these days. Six hours? Wow. I don’t remember games taking that long… but then again, it was a long time ago. My sons might appreciate it, but it would give me hives!